Holiday on your own private beach !! Honestly, just 4 footsteps to the sand!! Stunning views and birdlife. Tarif includes a complimentary 4WD CAR, OZONE SPA POOL, 2 KAYAKS and LIFEJACKETS and FREE FERRY TRANSFERS And NO Neighbours !!!! Enjoy an amazing romantic holiday for 2 in this luxury, totally secluded, absolute waterfront cottage nestled on 2 kilometers of private beachfront with riparian rights. A WONDERFUL Waiheke Island romantic retreat. Even in Winter, it is nice and warm! Surrounded by bush on a 450 acre farm the cottage has been completely restored as a large studio apartment and has been decorated with modern designer furnishings to provide a boutique , fully air-conditioned elegant living space. The Beach Bach is ideal for a honeymoon, a romantic weekend, an anniversary or a surprise birthday celebration. Perfect for couples who just want to relax and get away from it all. Read, swim or walk on our 2.5 km of private beach or enjoy one of the spectacular private bush walks across our 450 acre farm. Have a barbeque on the deck, dare to skinny dip or launch the complimentary kayaks just in front of the cottage to search out the secrets of the isolated bay and inlets. Sleep in luxury between Cotton sheets on a King Sized Bed. Stare at the stunning sea views while you enjoy a glass of champagne in the comfort of your own private Ozone Spa Pool, listening to the waves lapping at the beach just outside your door. Or just relax and watch the huge variety of visiting birdlife or the fish jumping or study the myriad of stars an catch a shooting star! Book a massage for two or a meal especially cooked for you at the cottage by a world class Chef, perfect for that special occasion. 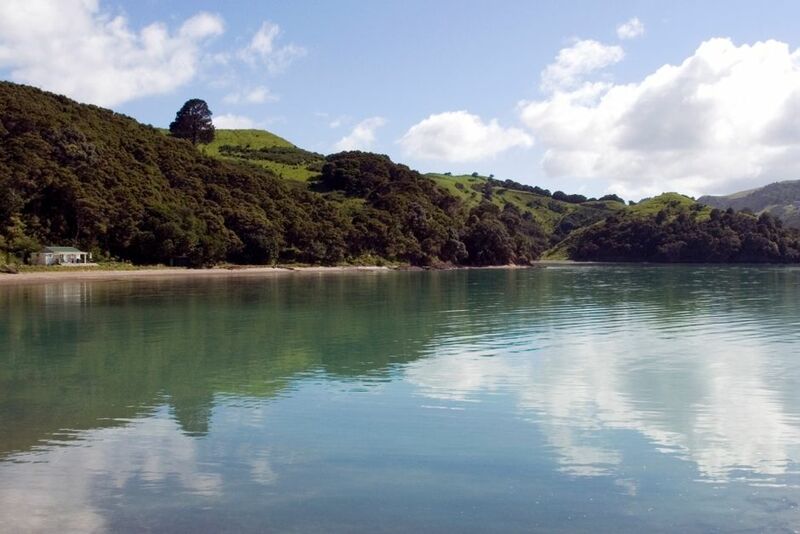 Explore the Whakanewha Park or visit the many restaurants and vineyards around the island in our complimentary 4WD car. All this and more, yet so close to Auckland! The perfect relaxing getaway location - A Slice of Heaven! four nights minimum during peak holiday season. ASK ABOUT OUR SPECIAL DEALS. Must be over 25 to use the complimentary car. Max 2 guests. No Pets. Great birdlife, beautiful views, jumping fish, shooting stars. ECO products used whenever possible. Beautiful property overlooking a sheltered bay. Stunning views from your bed or the relaxing spa. Every detail thought about by our host, we just walked in, and immediately unwound! Couldn't recommend it highly enough. Lenka is the perfect hostess! We wish we lived closer for a return visit! Such a beautiful location. We loved it! Temperature of the spa pool was just perfect and we could stay in for ages watching the stars on a mild, clear night. Had everything we needed. The only thing stopping us from giving this a 5 star rating was the occasional jet plane flying overhead. We would definitely recommend this place to friends and family. Beautiful property in an idyllic location. Very clean with everything you need for a weekend escape. Loved the spa and the sound of the waves lapping just outside the door. Thank you for making everything easy! The car was a great addition too and we loved exploring Waiheke. Absolutely stunning location and incredible property. Absolutely stunning seaside accommodation. Highly recommend this place, beautiful scenery, complete seclusion and we loved taking the kayaks around the bay. Great location close to wineries, but far enough away for a relaxing, peaceful stay. Absolutely perfect for our honeymoon and couldn’t have been happier. We will be back! Quick trips to vineyard lunches if you are that way inclined. Lots of bird life! We had an awesome time. Wonderful, world famous, Waiheke Island ! Large choice of vineyards and olive groves, lots of beaches and restaurants. Home of artists, musicians and actors. Full of character. Annual scuplture and art exhibitions.